Baybee is a granddaughter of a son of the immortal Bond Dynamo and out of a mare bred by Samis Lil Horse Ranch. 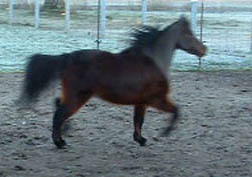 She is a pretty mare with lots of trot. Break her to drive and show her or breed her. AMHA eligible - Sire and Dam are both AMHA DNA'd. WORLD Grand Champion stallions and one of the leading performance sires. Her sire is a son of Sierra Dawn Unos Monarch (by Sierra Dawn Uno De Mayo) and a grandson of Bond AToy4UC and Little Kings Napoleon. Beautiful conformation. Would make an excellent halter prospect that later would be a great addition to your breeding program. Would make a good therapy horse as she has been handled a lot by people with Special Needs including a gentleman in a wheelchair. She is broke to drive. in Country Pleasure (AMHA Top Ten), Halter Obstacle, Hunter/Jumper and Showmanship. Would be very competitive in the new Classic / Western Pleasure Driving division. Would make a nice all around performance gelding for a Youth or Amateur. 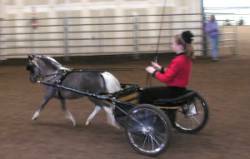 In 2009, Ernie finished 3rd in the State of Washington in driving in WASET (Washington State High School Equestrian Team) with a first time driver. Ruby is sired by World Champion Southridge Destined To Be, a stunning Destiny/Orion combination. Her dam is a bay splash overo mare by a son of the legendary Little Kings Napoleon, World Res.Grand Get of Sire and AMHA Honor Roll Champion Get of Sire and sire of World Champion Driving Horses. Ruby shows a fantastic trot. Ruby has a sweet disposition and is easy to handle. Ruby should make a World level country pleasure horse and is a great all-around youth or amateur prospect. HyNoon Pistolero - the whole package. Competitive in halter, color, pleasure driving, roadster, discipline rail driving, ideal driving and jumping in hand and ready to begin showing in trail in hand and showmanship divisions. Recently shown successfully by an Amateur handler and a 5 yo boy. Pistol has his PtHA Championship and is also registered with AMHR standing 37 inches tall. Pistol is available to a good show home. Also available his Graber cart, show harness, coolers, blankets, sheets and show halter. Want to win? Here's your ticket! This gelding is a grandson of AMHA World Grand Champion Single Pleasure Driving Horse, Celebrations Tennessee Talent. Professionally trained by Summer Sayles in halter, hunter and country pleasure. Rebecca McMilian in Country Pleasure and Hunter/Jumper. Can be Pinto registered. 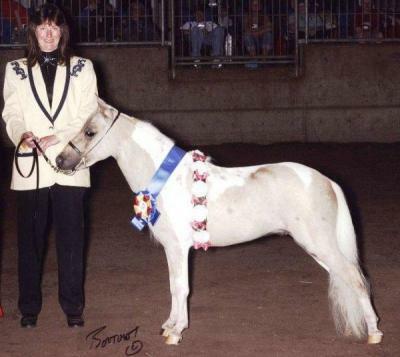 This filly's sire is a National Champion Halter and Driving horse and is a granddaughter of Little Kings Napoleon, sire of many AHA Naitonal Champions including National Grand Champion Single Pleasure Driving and Two Time AMHA Best All Around Horse, Scott Creek Fancy Pants. This leggy filly has great potential as a performance/driving horse and/or broodmare. AMHA Top Ten Halter and Futurity Driving Horse - would make a great all around youth/amateur horse - top country pleasure driving prospect. This mare will halter and/or make a Top Country Pleasure Horse or with her bloodlines she would be a great addition to anyone's breeding herd. Desperado has been professionally trained in halter. He has been well started in driving and hunter. He has the size and attitude to make a great all-around gelding for a youth or amateur. This stallion is sired by the Multi-National Halter and Driving Champion, Sierra Dawn Uno De Mayo, who has produced many National Champions and Top Ten horses. He is also a paternal brother to Sierra Dawn Unos Monarch. This colt has been bred to trot and has the pedigree to be a great addition to someone's breeding program. He is broke to drive and will be shown until sold. He measures 32". 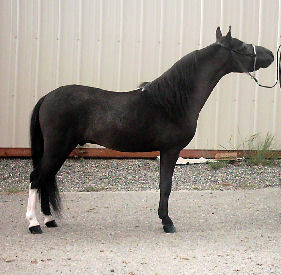 This colt is sired by the Multi-National Halter and Driving Champion, DRs Hide Away My Key T, and out of a Reserve National Champion Halter Mare, McSperitts Bay Rums Silver Shadow, who has produced many National Champions and Top Ten horses including AMHA World Grand Champion Single Pleasure Driving Horse, Celebrations Tennesse Talent. He is also a maternal brother to Celebrations Tennessee Tribute and Celebrations Patent Pending. No doubt this colt has been bred to trot and has the pedigree to be a great addition to someone's breeding program. He should mature around 32". This beautiful stallion is a paternal brother to the 2003 AMHA Single Pleasure Driving Champion and Reserve Champion. He has won numerous halter championships and is broke to drive. With his color he definitely stands out. Sire is an AMHA Top Five Halter and an AMHA Regional Reserve Champion Liberty horse. 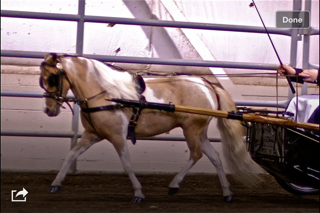 He is a grandson of Little Kings Napoleon who has sired many National Halter and Driving Champions (including Scott Creek Fancy Pants, AMHA National Grand Single Pleasure Driving Horse and twice BEST All-Around Horse). His dam is by Bond ATOY4UC, AMHA National Grand Champion Stallion. He is broke to drive and should be a top contender this coming year. Double registered AMHA and AMHR. As a junior gelding in 2000, he was the AMHA Western Regional Reserve Champion Junior Gelding and Champion Amateur Junior Gelding Level 1. He was also AMHA Top Five at the World Championship Show in Junior Geldings. 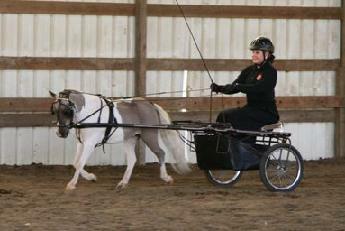 Foxy has been professionally trained in halter and driving and is well started in obstacles, hunter and showmanship. He would make a wonderful Youth or Amateur All-Around Horse. 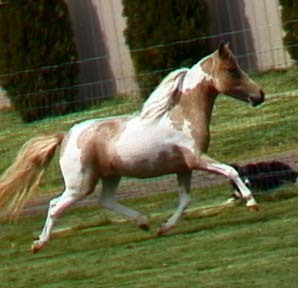 This mare is of HCM and Dell Teras breeding as well as granddaughter of Landrys War Paint. In foal to Celebrations Patent Pending for July foal. 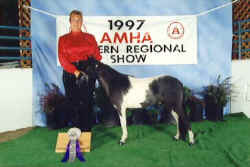 Patent has already produced many AMHA Champions and Top Ten horses. Terms of Sale . . .
* A minimum deposit of $500 is required on purchase per pony/horse. Deposits are non-refundable but may be applied toward purchase of another pony/horse within the calendar year. * Prices and availability are subject to change. Howard Stables reserves the right to refuse any sale if it is in the best interest of the pony/horse. 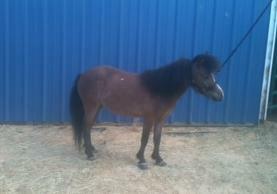 * Ponies/horses purchases over $1500 will come with a current Coggins and Health Certificate for transport. Ponies/horses under $1500, Coggins and Health Certificate are the responsibility of the buyer, we will help arrange for these to be done. * Shipping arrangements and fees are the responsibility of the buyer. However, we can recommend reliable transport who are accustomed to transporting ponies/horses within the USA and internationally. * Ponies/horses are available for pre-purchase inspection and exam prior to purchase at buyer's expense. Seeing pony/horse in person is highly recommended and encouraged. * No pony/horse may leave Howard Stables without being paid for in full. * We accept CASH, money orders or personal checks. Personal check MUST clear the bank before the sale pony/horse is allowed to leave the seller's property. * Ponies/horses are sold AS IS with NO GUARANTEES, unless otherwise stated in the sales contract.